A bridal bouquet made of polymer clay is chosen by a woman who dreams of preserving the memory of this beautiful day for a long time.Talented craftsmen copy natural flowers so accurately that it is difficult to guess about imitation from the exterior. A wedding bouquet of polymer clay can be made from plants that have never been found in nature. In some cases, when making an accessory, include fantasy, and guests begin to question the bride, from which tropical countries brought her this wonderful thing? It's not so difficult to make a bouquet. This requires patience, perseverance, imagination and the necessary material. When choosing an accessory, you should pay attention to its weight, the number of colors, and the presence of sharp parts. 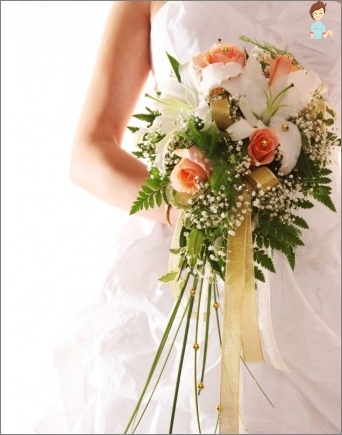 No sharp stems and imitation of spines, even if the bouquet is made up of "Roses". The bride should be comfortable. The color is chosen according to one's own taste under the dress. Such decorations look sometimes more attractiveClassical. The colors are brighter, the flowers from which they are made are more original. The choice of a flower shop is not limited by the compilers of bouquets. The disadvantage of polymer clay for bouquets of flowers is that it is a fairly fragile material. If the accessory is dropped, it can not be raised. And what about the traditional catching of the bride's bouquet? Prudent brides are preoccupied about this ritual in advance, acquiring a bouquet simpler, but from living plants. But the photo in the hands of the bride flaunts a miracle bouquet. Some believe that an artificial accessory at a wedding is a bad omen. Long-preserved flowers are a symbol of eternal memory. At the wedding, they have no place. Who thinks so - he buys natural flowers. It is not necessary to make a bouquet of scarlet or white roses from polymer clay and keep them in hand during the solemn event. These flowers are more appropriate to look on the hood of the car. Fashion for the decoration of the vehicle does not change for many years. By the way, clay plants adorned the doors of England's bride's cabs back in the XII century. A flat wooden plank, similar to a stand for hotter. Without a flat support, it will not be possible to mold. Not everyone can feel the material in gloves. The similarity of the core of a pink bud is worn on a toothpick. The other petals are made in exactly the same way as the first, only the sizes change - each next petal is slightly larger than the previous one. All the petals are adjusted to each other, tightly overlapping one another. The circle must be flat. On the outer petals, corners are formed, so a more accurate imitation of the rose is achieved. Now you need to fashion a sepals and a few pink leaves. Edges bend to make the cup turned out "How alive". Then a molded leaf is placed on the bud, closing the lower part of the already prepared inflorescence. The process will have to be repeated 4-5 times, just as much as a real rose sepals. Then finely roll out the polymer material, wrap the toothpick with it - the stem is obtained. To it attach the leaves, formed already according to the described algorithm. If white clay was used for the flowers, then they should be painted with acrylic paint. In this process, gloves can not be dispensed with. Color the products after the material has dried. Choose those colors that you want. It is not necessary to follow the traditional "Pink»Colors. However, now flower growers have learned to grow roses of all colors and shades: ultramarine, green, even black. On average, one flower should be spent about an hour. For production, ClayCraft polymer clay from DecoClay is used. 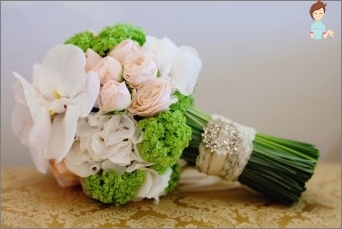 Bouquets in the master class are made up of small flowers. Tailor's pins. It is desirable that they have clear heads. So many balls are formed, how many then there will be petals in the flower. A flat drop is formed from each sphere. It is rolled out on the palm of your hand, with your fingers in the thick part creating a characteristic groove. The resulting petals overlap one another, slightly shifting diagonally. Petals are glued together with concave sides - as they fold the spoons. The resulting fan turns off In a spiral. Then several large petals are formed and they terminate the inflorescence. Sepals and leaves are molded according to a known pattern. It is easier to do this if you have an acrylic form with a sheet pattern printed on it. You do not need to draw every vein. It is enough to apply the rolled preform to the acrylic form. By the form are created sepals of buds and plant leaves. As a stem, floristic wire is used - it is wrapped in a floristic teip-tape and attached to the resulting base of the leaf - higher to the flower. To match the color of the imitation of the present plant, the polymer clay of different colors must be mixed. Pale green is obtained from white and green, pink - from red and white. 2-3 sepals are stuck on it. If the bouquet is wrapped, like a real one, in decorative paper, the tape tape may not be needed. Which company choose clay for modeling - it does not matter. It is desirable that the material does not have to be baked later. The most famous manufacturers of applied material are: Thai Clay, Cernit, Pardo, Fimo. But to beginners "Florists"It's better to start with Fimo Soft or Sculpey. These materials have a big plus - they are soft, and with a timely detected error, it is possible to reform the product. From polymer clay, you can create a variety of accessories: flowers, parts for jewelry, frames for paintings and photographs. It is desirable to work with polymer clayInvolve children. The material is more plastic than plasticine, the results of labor are long preserved, which is an additional stimulus for children's creativity. In addition, such work develops fine motor skills, which is very important for preschool children and younger schoolchildren.